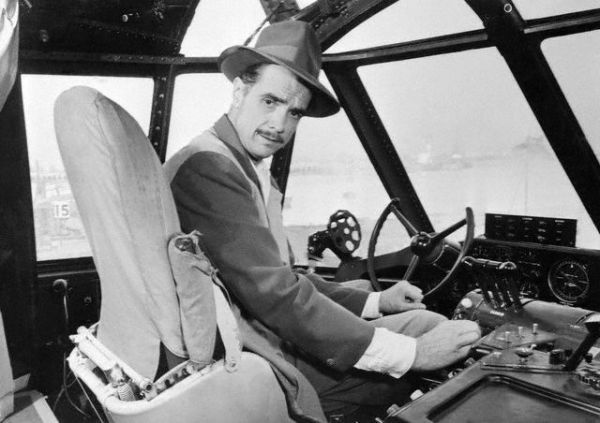 Howard Robard Hughes, Jr. was an American business tycoon, entrepreneur, investor, aviator, aerospace engineer, inventor, filmmaker, and philanthropist. During his lifetime, he was known as the wealthiest self-made man in the world. Also Known As Howard Robard Hughes, Jr.
Howard Hughes' father, Howard Hughes Sr., made his fortune by designing a drill bit that could drill through hard rock. Before this new bit, oil drillers weren't able to reach the large pockets of oil lying beneath the hard rock. Howard Hughes Sr. and a colleague established the Sharp-Hughes Tool Company, which held the patent for the new drill bit, manufactured the bit, and leased the bit to oil companies. 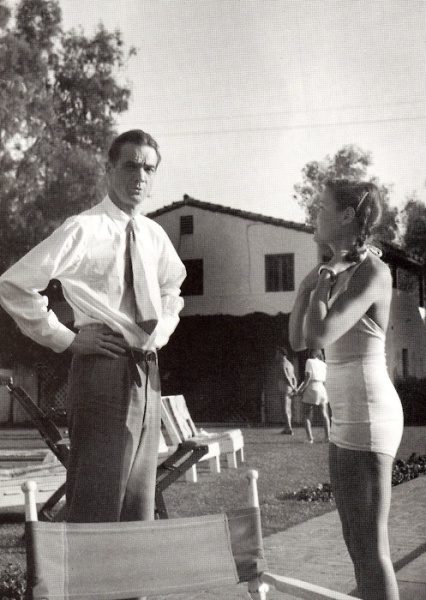 Though he grew up in a wealthy household, Howard Hughes Jr. had difficulty focusing on school and changed schools often. Rather than sitting in a classroom, Hughes preferred to learn by tinkering with mechanical things. For instance, when his mother forbade him from having a motorcycle, he built one by building a motor and adding it to his bicycle. Hughes was a loner in his youth. With one notable exception, Hughes never really had any friends. Hughes immediately disagreed with his relatives over the running of Hughes Tool Company, but being only 18-years old, Hughes could not do anything about it because he would not legally be considered an adult until age 21. Frustrated but determined, Hughes went to court and got a judge to grant him legal adulthood. He then bought out his relatives' shares of the company. At age 19, Hughes became full owner of the company and also got married (to Ella Rice). In 1925, Hughes and his wife decided to move to Hollywood and spend some time with Hughes' uncle, Rupert, who was a screenwriter. Hughes quickly became enchanted with movie making. Hughes jumped right in and filmed Swell Hogan but quickly realized it wasn't good, so he never released it. Learning from his mistakes, Hughes continued making movies. His third, Two Arabian Knights won an Oscar. With one success under his belt, Hughes wanted to make an epic about aviation and set to work on Hell's Angels. It became his obsession. His wife, tired of being neglected, divorced him. Hughes continued making films, producing over 25 of them. 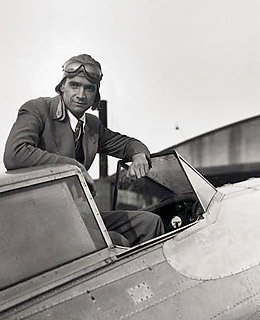 In 1932, Hughes had a new obsession -- aviation. 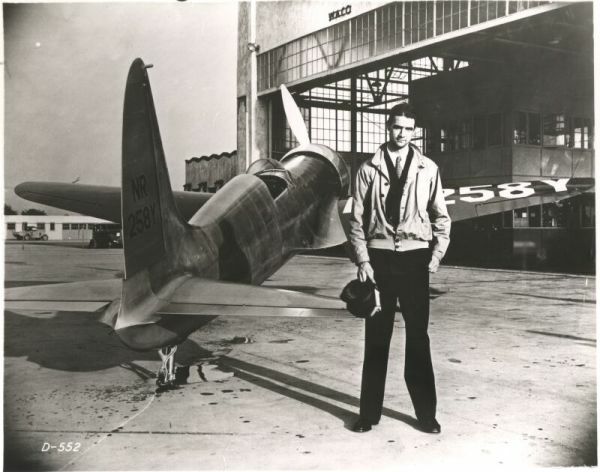 He formed the Hughes Aircraft Company and bought several airplanes and hired numerous engineers and designers. He wanted a quicker, faster plane. He spent the rest of the 1930s setting new speed records. In 1938, he flew around the world, breaking Wiley Post's record. Though Hughes was given a ticker-tape parade on his arrival in New York, he was already showing signs of wanting to shun the public spotlight. In 1944, Hughes won a government contract to design a large, flying boat that could carry both people and supplies to the war in Europe. The "Spruce Goose," the largest plane ever constructed, was flown successfully in 1947 and then never flown again. Hughes' company also developed a chain feeder for the machine guns on bombers and later built helicopters. By the mid-1950s, Hughes' dislike of being a public figure began to affect his life severely. Though he married actress Jean Peters in 1957, he began to avoid public appearances. He traveled for a bit, then in 1966, he moved to Las Vegas, where he holed himself up in the Desert Inn Hotel. When the hotel threatened to evict him, he purchased the hotel. He also bought several other hotels and property in Las Vegas. For the next several years, hardly a single person saw Hughes. He had become so reclusive that he nearly never left his hotel suite. In 1970, Hughes' marriage ended, and he left Las Vegas. He moved from one country to another and died in 1976, aboard an airplane, while traveling from Acapulco, Mexico to Houston, Texas. 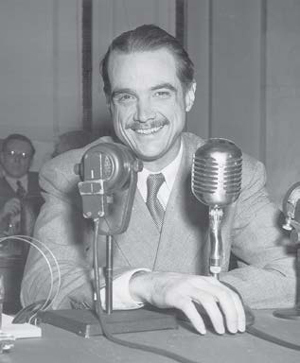 Hughes had become such a hermit in his last years that no one was sure it was Hughes that had died, so the Treasury Department had to use fingerprints to confirm the death of billionaire Howard Hughes.